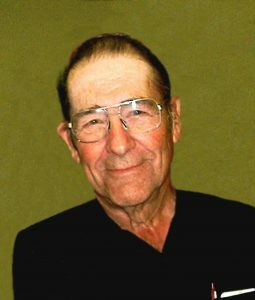 Keith Nichols, 89, of Fullerton, died Wednesday March 29, 2017, at the Schuyler Care and Rehabilitation Center in Schuyler. Mass of Christian Burial Tuesday, April 4, 2017 10:30 A.M.
Keith was born on August 20, 1927 to Clyde and Ethel (Daley) in Genoa, NE. Keith enlisted in the Navy in 1944. He married Henrietta Shotkoski on October 8, 1945 at St. Peter’s Catholic Church in Fullerton. After Keith’s discharge from the Navy, they purchased the Fullerton Dry Cleaners which they operated for 40 years. Keith then went to work for the Co-op in Fullerton and retired after 25 years. Keith was a member of St. Peter’s Parish, Holy Name Society, the Lion’s Club, the American Legion, a member of and past president of the Nebraska Dry Cleaners Association as well as a 40 year member of the Fullerton Volunteer Fire Department. Keith and Henrietta had 5 children. Kathy and Jim Horn of Schuyler, Mic and Linda Nichols of Schuyler, Colette and Pat Dubas of Woodbine, Iowa, and John Patrick and Richard Joseph who died in infancy. Keith is also survived by his sister, Carol (Chuck) Delancey of Fullerton, Sisters-in-Law Reva Nichols of Cozad, Joan Shotkoski of Fullerton and brother-in-law and sister-in-law Jim and Cindy Shotkoski of Scribner. Keith was preceded in death by his wife Henrietta in 2011, parents, brothers, Neil (Eloise) Nichols, Don (Pauline) Nichols, brothers, Leon, Gary and sister Viola (Kim) Willis. Keith was a loving grandpa to 11 grandkids, 27 great grandkids and 3 great, great grandkids. He loved to camp, golf, spend time with his kids, grand and great grandkids and winter on South Padre Island, Texas with Henri.